I have lots of BIG NEWS to share with you!!!!! I am now officially an international bestselling author!!!! 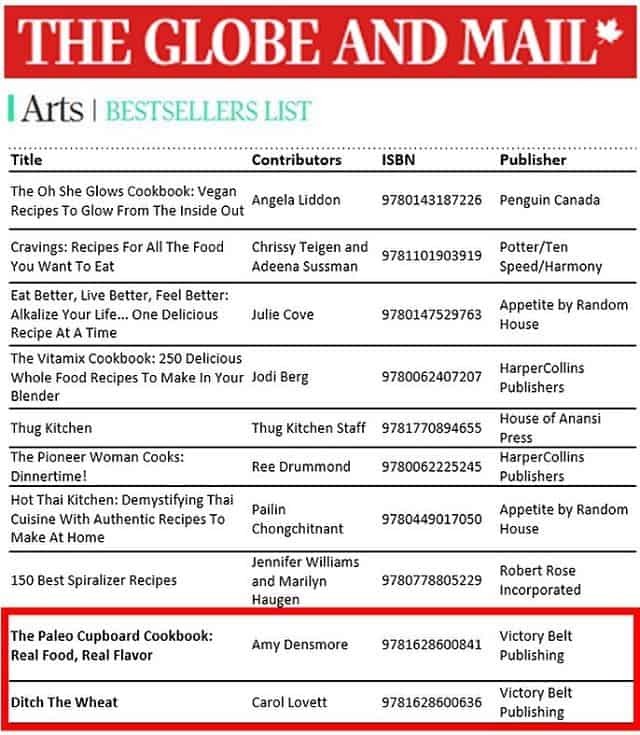 On Monday March 21st, Susan, who handles PR for my publisher let me know the Ditch the Wheat cookbook made the Globe & Mail Bestseller’s list!!!!! It was a total shock to me. Thank you Canadians for supporting the cookbook!!! The cookbook is still in all Costco stores & major bookstores. It is sold out on Amazon.com. Since we ran out of stock I also got the thrilling phone call most authors don’t get, the cookbook is going for a second print run!!! Another 25,000 copies or something like that. 8 Sneak Peek Recipes from the Ditch the Wheat cookbook!! !